Two carnivores hunting in the woods. There’s something to be said about harvesting an animal that is perfectly capable of harvesting you. We encountered this beautiful beast while hunting Spring turkeys. With Autumn comes a different season. Marinade thin bear strips in a splash of soy sauce, fresh ginger, fresh garlic, with a pinch of ground mustard. Marinade over night or vacuum marinade for 30 minutes. The longer the better. Place enough flour to coat the meat in a repurposed produce bag. Drain and save marinade juice from meat. Place meat in bag of flour, toss to coat. Heat a splash almond oil with a dollop of coconut oil in a skillet over medium high heat. Fry bear meat until crisp (avocado/coconut oil blend is excellent for this). Add juice from marinade, barbecue sauce, and orange zest. Simmer on low until desired tenderness. Usually 30 minutes or more. Add water if needed. Check temperature at this step. Raise heat to caramelize sauce. Serve over wild rice, fried bean noodles, or whatever you like. Garnish with sesame seed and green onion. Give thanks for the organic protein gracing your table. Enjoy. Note: To ensure complete and safe cooking, cook to 160 degrees for 3 minutes or more. Important. ALWAYS check the temperature to ensure complete doneness. Never skip this step when cooking bear. 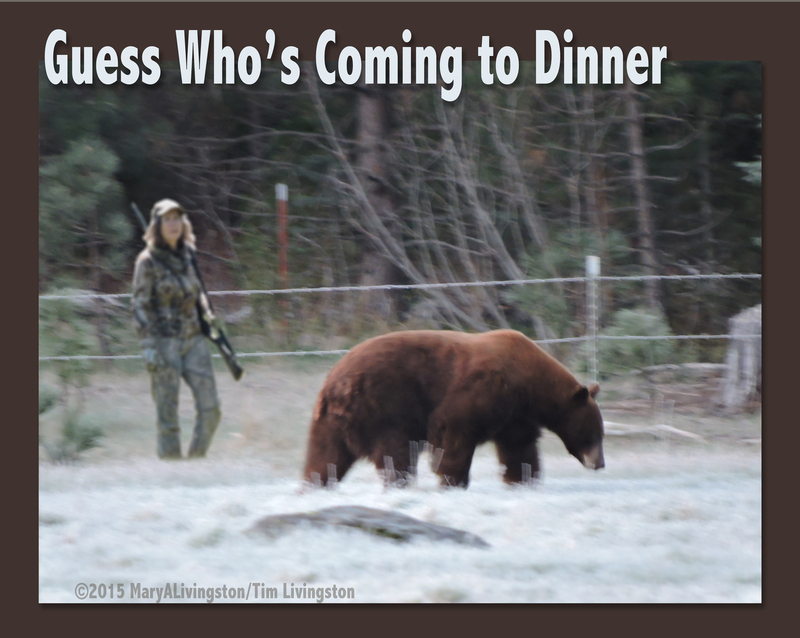 This entry was posted in Nature, Photography, Wildlife and tagged Bear recipe, black bear, hunting, orange glazed bear, women hunting by MaryALivingston. Bookmark the permalink. I’m drooling just thinking about it!!! You definitely have the right program going; eat what you harvest. With the Asian approach that you have perfected I would give it a try! It’s delicious. We usually serve it over the bean noodles. I’ve never measured out the portions, I may have to do that sometime. I find though, most cooks like to balance out seasoning to suit their own taste. If you’ve never eaten black bear, let me tell you, it’s delicious!